Our brand new 2016 Peshtemal Turkish Towel collection is ready for you! Adore pestamel towel has it is unique shape texture which inspired from tangram designs ! We know you will love it and will use everyday ! 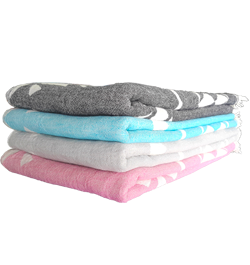 Adore fouta comes in four colors for now ; black, turquoise, pink and light grey but we are ready to increase the color options regarding to your inquiries.